During the final class session in A.F.T.E.R. -- a school program designed to help teens deal with the trauma of the terrorist attacks in September 2001 -- each student wrote an anonymous letter to an imaginary terrorist. Excerpts from those letters are presented here, showcasing the range of emotions children experience and their reaction to terrorism. There is, peculiarly, in almost all of them, an absence of anger. Some are funny: "Why don't you come over here and teach the Boy Scouts how to live in caves?" Many are sad: "I just don't understand why you do what you do. Don't you know how hurtful you are?" But almost all contain empathy and hope. About John Shuchart (Author) : John Shuchart is a published author. 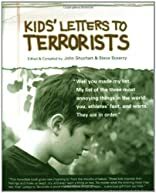 A published credit of John Shuchart is Kids' Letters to Terrorists. About Steve Scearcy (Author) : Steve Scearcy is a published author. A published credit of Steve Scearcy is Kids' Letters to Terrorists.